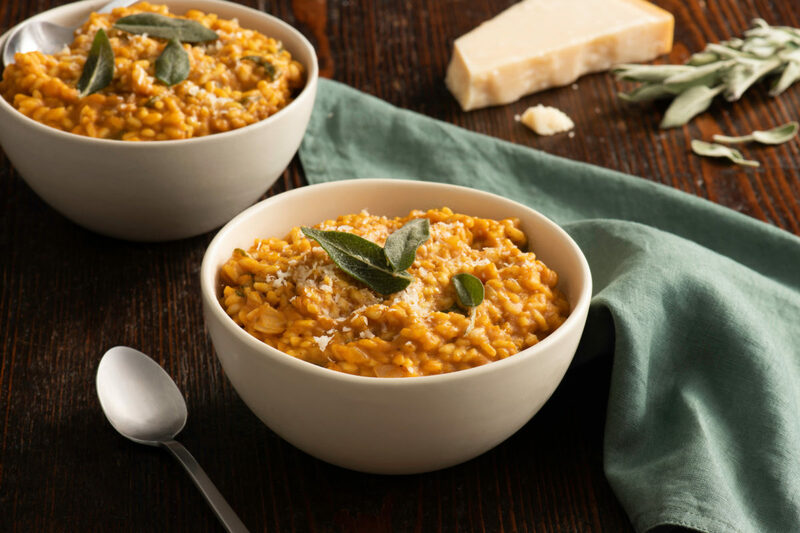 Cooking the risotto with a brown butter base adds a depth of flavor that complements the pumpkin, sage and garlic beautifully. Heat oil in small skillet set over medium heat. Add half of the sage leaves; cook for 3 to 5 minutes or until crisp. Transfer to paper towel–lined plate to drain; set aside. (Reserve sage oil for another use). Combine 5 cups water, pumpkin, garlic base and bay leaves in saucepan set over medium-high heat; bring to boil. Reduce heat to low and keep hot. Heat butter in high-sided skillet set over medium-high heat, swirling pan for 1 to 2 minutes or until butter stops foaming and turns light brown color. Reduce heat to medium-low; cook onion and chopped sage, stirring, for 3 to 5 minutes or until softened. Stir in rice, salt and pepper until well coated. Add wine; cook, stirring, for 2 to 3 minutes or until absorbed. Ladle in 1 1/2 cups pumpkin broth; cook, stirring constantly, until absorbed. Continue to add broth, stirring in 1 cup at a time, until all of the broth is absorbed and rice is creamy and tender, about 25 minutes. Stir in grated Parmesan and nutmeg. Garnish with shaved Parmesan and sage leaves. Tip: For even creamier risotto, add a splash of heavy cream at the very end before serving.